This week I’ll be departing a bit from what my intro to filmmaking class actually covered because to be quite honest, what we covered was… well… not too worthwhile. Instead, we’ll be talking about sound acquisition and editing. Oh, and if you go the route of getting an external microphone, you’ll need to have a mic-in jack on your camera. Since the world is far from being perfect and is instead full of bitterness and misery, none of these things are required. Now before we get started, I need to preface this discussion by pounding something into your head. You heard me, sound is hard. REAL hard. Harder than picture. Picture’s easy. Sound isn’t. Got it? Sound is hard. You may think it’s easy because it sure seems simpler than picture, but it’s not. It’s really, REALLY HARD. I can’t remember exactly what I assigned in the first class, but I didn’t expressly prohibit sound. Which probably means most of you made something with sound. Which probably means your movie sounds like crap. That’s OK. You didn’t know any better. The problem is that since your movie sounds like crap, it also looks like crap. This is called… (it doesn’t have a name and so I’m naming it for myself) The Gingerich Theory of Crappitude. You would be amazed how good your movie would look if only it had good sound. So how do you trick those idiotic rodents into thinking your whole movie was really good? Unfortunately, you can’t. Remember how I said they’re incredibly cruel and they like to focus on your faults? You can’t get around that. The best thing you can do is give them as few faults as possible to focus on. When people start complaining to you about minor continuity errors, that’s when you know you’ve made a good movie. You can’t see sound (unless you’re on acid), and so you tend not to think about it when you’re shooting. (Incidentally, don’t shoot if you’ve just dropped acid. Someone’s liable to end up dead and knowing your luck it probably won’t be you and so you’ll wind up in court trying to explain it.) So inevitably what you will happen is that you’ll set up a very nicely-composed shot and it will sound REALLY HORRIBLE. To not do that, you’ll have to train yourself to think about sound. Professional productions use what is called a microphone to capture sound. That’s what you do too. The difference is that they tie it to a long stick and hold it over the actors’ heads. Granted, it’s usually a really expensive stick, but that’s the general idea. Because the microphone (or mic, if you’ve got a crew member named Mike and you want to confuse him all the time) is so close to the action, it gets very clean sound. Additionally, the mic is pointed down at the actors, and so you hear less ambient noise (basically just white noise produced by the environment you’re in: wind, traffic, etc.). If you were to buy the mic, fishpole (the stick the mic is attached to, sometimes called a boom), transformer and cable I mentioned in the beginning, you’d be set to get great sound. If you plan to continue in film with any seriousness, these things are probably a good investment. Things to consider when going this route: Congratulations. You’ve made the right decision. Remember that your microphone needs to be placed in a shock mount (the mic I linked to includes its own), which is basically just a way to suspend the mic in between an array of rubber bands. This prevents vibrations in the fishpole from being transmitted to the microphone and onto your soundtrack. You’ll also need to know the proper way to hold the fishpole. You (or one of your slaves) hold it with both hands (on the vibration-absorbing rubber grips) up over your head and parallel to the ground, so that the mic points straight down. Hold the mic about 12-18 inches above your actor’s head. If it gets farther away than that you’ll get background noise. If it gets closer, you’ll get distortion. More on that later. Make sure the mic is turned ON and plugged into your camera. Remember to keep the mic out of shot. Whichever method you use, you need to eliminate as much noise as possible from your location. Turn off all fans and air conditioners to reduce airflow. Close all doors and windows. Unplug the refrigerator (hint: leave your keys in the refrigerator so you remember to plug it back in when you’re done). Try and get the neighbors to turn off their radio. In short, it must be SILENT. If you’re shooting on a tile floor, put down blankets, pillows, rugs—anything—over non-visible areas of the floor in order to reduce reverberation. NOW you’re ready to shoot. Take a break. We’ll meet back here in 20 minutes. The simple summary is that editing sound is just like editing picture. Most of the time with sync (short for synchronous—as in synchronized with the picture) sound, the audio clips just sort of go along for the ride while you edit the video. This is a good thing because it’s easy. But there will inevitably be things in the soundtrack that you’ll want to fix once your picture editing is finished, or locked. This is where your editing software will show its true colors. Good software will let you work with sound independent of video. Bad software won’t. If you’ve got bad software, you’re done now and probably not very satisfied. Goodbye. If you’ve got good software, you can use it to make your movie sound good. Methods for working with sound separate from video vary from program to program, so read your manual. Trim your sounds. Slide them around and line them up. Make something that sounds good. Be sure to keep dialog in sync with lip movements. Remember that you can use the sound from one take and the picture from another, although it might take some fine cutting to line them up. This is a surprisingly viable option for getting clean sound in wide shots. These are especially useful for scene transitions. I warned earlier about keeping the mic from getting too close to the actors to avoid distortion. No, that doesn’t mean they turn into a Dalí painting. Instead, it means something way less cool: audio that’s too loud and sounds all… buzzy. It’s not good. Well, that distortion that you have to avoid during shooting—you also have to avoid it in editing. Here’s how: If your software is good enough to cut sound independent of picture, it is hopefully also good enough to have a VU meter, which is a little bar (or two bars, if you’re working in stereo) that bounces around to reflect the loudness of your audio track. If you don’t have one of these you’ll have to play it by ear and will probably fail miserably. Good luck! If you DO have a VU meter, it’s easy: never get to the absolute maximum volume. That’s how you avoid distortion. Theoretically if you shot your material distortion-free and didn’t increase the volume when you were editing, you should be fine. But if you’re increasing levels (again, check your manual to find out how) or layering audio and adding effects, things can get a little out of hand and you start maxing out. Here’s why: look at those numbers on the VU meter. They go from 0 to negative infinity. What the hell kind of scale is that? It’s a damn stupid kind, that’s what! Anyway, we have to use it. The loudest your sound can be is 0 (what?!) and the quietest it can be is negative infinity (abbreviated -inf), which is no sound at all. You usually want dialog levels to peak anywhere from -12 to -3 db (decibels), depending on audio quality and what other sounds you have playing in the scene. Bring levels up and down on clips to appease the VU meter. 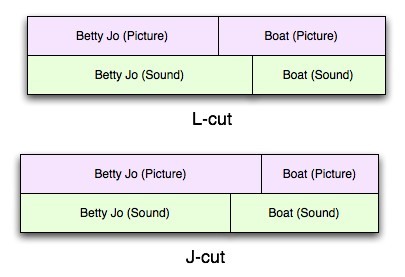 If you want to gradually change an audio clip’s output levels over time, you can use a method called keyframing. You will be using keyframes a lot when you get into more advanced editing. Their simplest editing application is in setting audio levels. Put a keyframe in the clip levels (check your manual blah blah) on the frame where you want the change to start. Set it to the starting value, let’s say 0 (no change in audio levels). We’ll pretend you want to, over the course of two seconds, go from a value of +0db to +3db. You’ve already set the +0db keyframe, so go forward 2 seconds (60 frames) and add a second keyframe. Then set that keyframe to +3. You will probably see some sort of graphical representation of this keyframe change, something like a diagonal line between two points. The diagonal line represents the value of the levels setting at that frame, and the points represent your keyframes. You’ll notice that the audio level rises gradually over the course of two seconds rather than jumping immediately from 0 to 3. This is a good thing. It’s always best to do things gradually when dealing with sound. What you just did was animate the levels property. Congratulations! You’re an animator! Put it on your résumé! And that’s it for this week. You have a choice in your assignment for next week. You can either clean up (or, if you’re daring, re-record) the sound you got for your short film (if you did a silent film, add sound), you can re-shoot your original short film, applying your new aesthetic and technical knowledge to get really good picture and reallllllly good sound, or you can shoot an entirely new film with realllllly good picture and realllllllllllllllllllllly good sound. Your choice. Finish it for next week, because we’ll be talking about putting your movie onto DVD and other methods of releasing it into the wild. – Dr. Mr. Prof. Sir Rev. Lord. A. D. Gingerich, M.D. emeritus, Esq. I would like to see Crappitude.com get fleshed out, though. you could make it a database and forum for user-submitted video, like student assignment films (remember Philosophy Time?) or anything else that comes out of ExG that doesn’t really deserve posting on this website. Good job, men. Now, load and HE round into the main gun and let’s go at ’em again. 1. I agree. Crappitude.com is… well… awesome. I’m impressed. 2. Yes. We audio engineers really do hate you. And your family. And your pets. 3. You should write a book, Andrew. This is awesome. OK, Greg, here’s the deal: you find me a willing publisher and I will write a book. Whatever the case, it’s been three weeks since I started film class and I’ve already written 6500 words on it. There must be a name for this sickness.